There’s only so much vertebrate biomass to go around. If one vertebrate population increases, some others are going to decrease; it’s not rocket science. 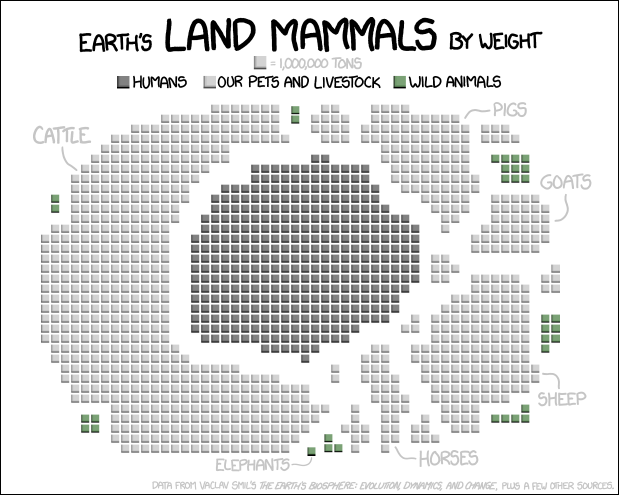 How much terrestrial vertebrate biomass is made of humans? And how much of it is made by the animals we domesticate for your food? The answer is surprising — and like most surprising stuff these days, depressing. ⟵Will Giving the Climate Message Hurt My CD Sales?